Last weekend at the Hall of Fame ceremony, Triple H and the rest of the D-Generation X members took several shots at All Elite Wrestling. Triple H's comments on the rival promotion have been edited out during the replay of the ceremony on the one-hour USA Network special. Triple H and his DX brethren took a string of scathing jibes at All Elite Wrestling during their Hall of Fame induction speech. The Game talked about the title of Executive Vice President and stated that putting this title in front of someone's name makes them feel important. This was a direct shot at the EVPs of AEW, Cody Rhodes, Kenny Omega, and The Young Bucks. Shawn Michaels was not one to hold back as he commented on Billy Gunn's supposed history of "under-performing". "You can always count on 'ol Billy Gunn to over-promise and under-deliver. We thank you for being out here and being 'All In'." It is now being reported by Wrestling Inc. that WWE have edited Triple H's comments out of the WWE Hall of Fame ceremony replay. This reportedly includes the one-hour USA Network special that aired on two consecutive Mondays after the original broadcast. During the speech, no direct reference was made towards AEW. One wonders why WWE felt the need to go out of their way and edit out the comments made by Triple H.
AEW's Double Or Nothing" show is all set to emanate from the MGM Grand on May 25th, 2019. 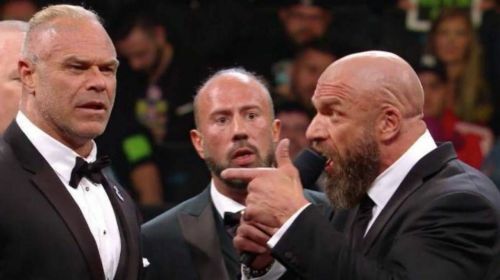 What was your reaction to Triple H dissing All Elite Wrestling during DX's Hall of Fame induction speech? Was it all in bad taste? Sound off in the comment section!